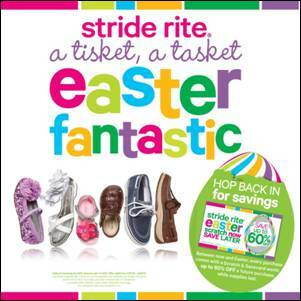 Woven by Words: Stride Rite "Easter Fantastic"
For years, Stride Rite has been the go-to destination to find those special shoes for your children on Easter Sunday, and this year, they are offering shoppers an “Easter Fantastic” promotion. Now through April 8 with any purchase, shoppers will receive an egg containing a Scratch & Save card worth up to 60% off a future purchase (for use April 10 thru April 22). Nice! I may have to get to our store today so I can score one of these- my dude needs shoes anyway & I loveeee Stride Rite! Thanks for sharing the great deal at Stride Rite!